This year, for the first time, TCB-North America offered a Tourism Sponsorship Page and Coop Advertising Program with TripAdvisor, the world’s largest travel site. 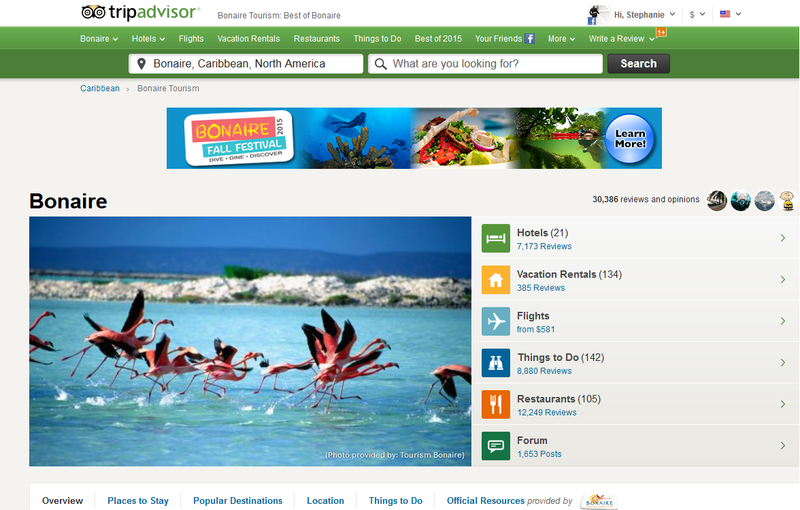 So far this year, TripAdvisor is delivering big for Bonaire! Bonaire’s overall click-through-rate (CTR) has been .18%, which is more than twice the industry average of .08%, (as per the Google benchmark). In terms of the Caribbean, Bonaire ranks above average with a bubble rating 4.70% above the Caribbean average. Bonaire currently has 31,222 reviews and opinions, 368 Bonaire businesses listed and an average 4.45 rating. TripAdvisor branded sites make up the largest travel community in the world, reaching 375 million unique monthly visitors, and more than 250 million reviews and opinions covering more than 5.2 million accommodations, restaurants and attractions. The sites operate in 47 countries worldwide. The Bonaire Homepage on TripAdvisor has native advertising information including photos, videos, links to special promotions, hotel packages and events taking place throughout the year on Bonaire.